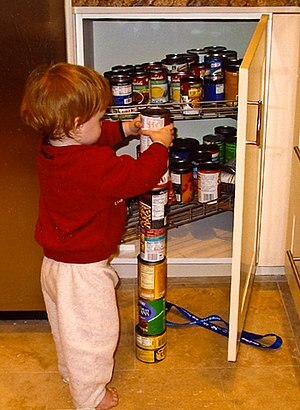 Repetitively stackin or linin up objects is associatit wi Asperger syndrome. Asperger syndrome (AS), an aa kent as Asperger's, is a developmental disorder chairacterised bi signeeficant difficulties in social interaction an nonverbal communication, alang wi restrictit an repetitive patterns o behaviour an interests. As a milder autism spectrum disorder (ASD), it differs frae ither ASDs bi relatively normal leid an intelligence. Awtho nae required for diagnosis, pheesical clumsiness an unuisual uise o leid are common. Symptoms uisually begin afore twa years auld an teepically last for a person's entire life. ↑ 1.0 1.1 "Autism Spectrum Disorder". National Institute of Mental Health. September 2015. Retrieved 12 March 2016. ↑ "F84.5 Asperger syndrome". World Health Organization. 2015. Retrieved 13 March 2016. ↑ McPartland J, Klin A (2006). "Asperger's syndrome". Adolesc Med Clin. 17 (3): 771–88. doi:10.1016/j.admecli.2006.06.010. PMID 17030291. ↑ Baskin JH, Sperber M, Price BH (2006). "Asperger syndrome revisited". Rev Neurol Dis. 3 (1): 1–7. PMID 16596080. This page wis last eeditit on 16 Apryle 2019, at 11:56.